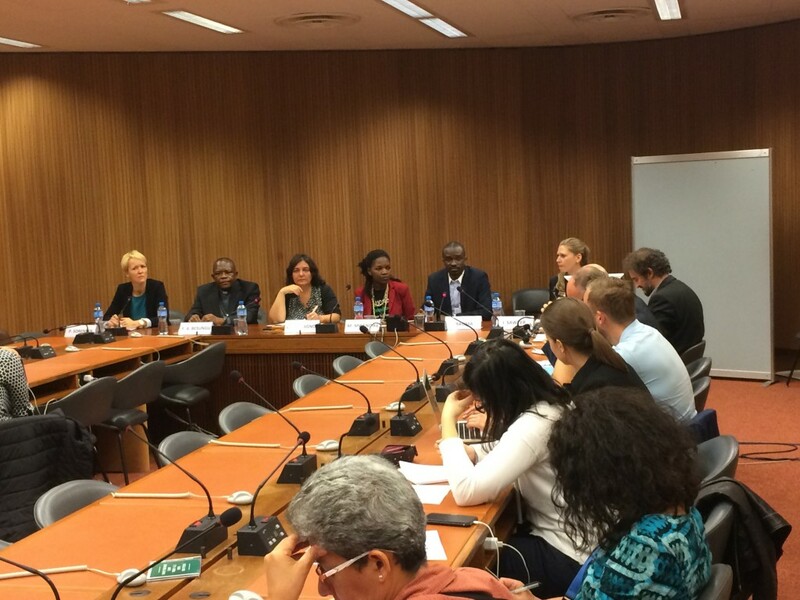 Geneva – Monday the 26th of September, during the 33rd session of the Human Rights Council a side event was held at the Palais des Nations to address the increasingly violent and precarious political situation in the Democratic Republic of Congo. 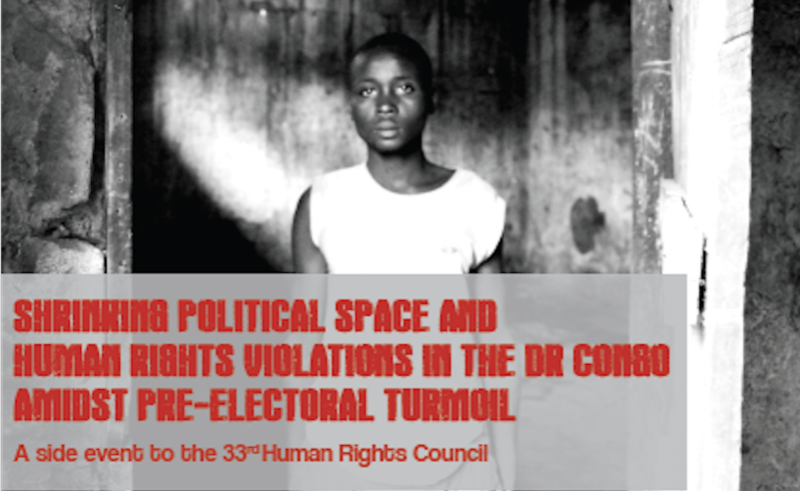 The event, “Shrinking Political Space and Human Rights Violations in the DR Congo Amidst Pre-Electoral Turmoil”, was the result of a collaboration between several NGOs, including members and partners of CCIG, among them: Dominicans for Justice and Peace, Franciscans International, Caritas Internationalis, European Network for Central Africa (EurAc), and Fastenopfer. The panel consisted of Msgr. Fridolin Ambongo Besungu, Vice President of the Commission Episcopale Nationale du Congo (CENCO), Ms. Ida Sawyer a Researcher at Human Rights Watch (HRW), Ms. Micheline Mwendike, a member of the Congolese youth activist group, Lutte pour le Changement (LUCHA), and finally Mr. Fred Bauma, a member of LUCHA who was wrongfully detained in Congolese prisons for 17 months. The discussion was moderated by Ms. Donatella Rostagno, Director at the European Network for Central Africa (EurAc). This coming December will mark the end of the constitutional term of the DRC’s current president, Mr. Joseph Kabila. H owever, according to the speakers, he has not demonstrated any sign of willingness to step down. Large groups of activists and members of the opposition have been groundlessly arrested and detained by Congolese security forces since January 2015. In the past few weeks, events have turned particularly violent. On September 19th alone upwards of 50 people were killed by security forces during a demonstration by the opposition. Msgr. Ambongo Besungu, expanded on the details of the violence in recent weeks, and stressed the importance of all sides of the political debate joining together to conduct a meaningful, productive dialogue. He explained that the efforts at dialogue organized by the government had been unrepresentative and therefore unsuccessful. He expressed the need for a more inclusive discussion mediated by an international body. Participants of the conference had the privilege of hearing from two Congolese youth who experienced first-hand the oppressive actions of the DRC government. First, Ms. Micheline Mwendike spoke of her youth witnessing violence and how that led her to join a nonviolent group like LUCHA: “I’ve seen blood too often, but I’m a militant of non-violence” she said. Ms. Mwendike asserted the direness of elections being held for she sees the DRC as on the path to becoming a full-blown dictatorship. She urged international actors to get involved and to treat the current situation as a serious human rights issue. Ms. Fred Baum continued to discuss the problem in terms of human rights. He recounted his detainment and described how he was treated as though he were an object, a ‘parcel’ in his words, and not a human being. He explained that the government criminalizes activists, human rights defenders and all members of opposition and that he himself was considered a terrorist for merely demanding his rights to democracy. Unfortunately, stories like Mr. Baum’s are not uncommon for activists in the DRC. Time after time, members of the panel insisted on the criticalness of timely election being held in the DRC to set the country on the right path towards democracy and the observation of human rights. Collectively, the panelists urged the international community to get more involved in the conflict by mediating dialogue between government and members of the opposition. No Comments to "Reaching a Critical Point in the DRC"